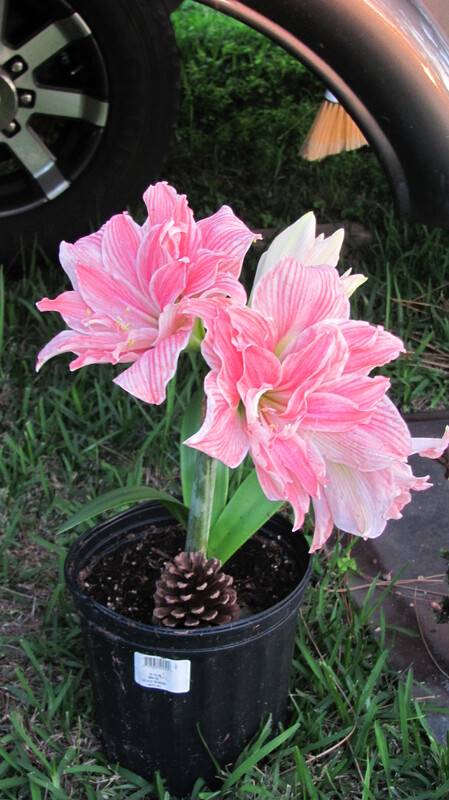 Last year I bought this lovely Amaryllis and decided to try and keep it and make it bloom again. Living in an RV has it’s challenges! Last August I put the bulb in the refrigerator until December. Then I potted it up and viola! It not only bloomed but put out four flowers just like last year. We’re in Florida staying with our daughter and her husband. They’ve graciously said we could park in their backyard. Jim had quad bypass last September and is doing well in his recovery. Thank goodness they found the problems before he had a heart attack! Not sure how long we’ll be here. This part of Florida is quite nice in the winter months, but to far south for the summer months.